The old town was nearly unrecognizable. Most of the buildings I knew were still standing, in a dry, lifeless scenery. Lack of flexibility and time prevented me from walking around and exploring, but the helmet allowed me to get a glimpse of what has happened. The government does not easily grant permission for visits to the “old land”, due to security reasons, since contamination of air, water and soil prohibits survival for more than a few minutes even in highly protective uniforms. As a result, conspiracy theorists have emerged, claiming that all images of the “old land” being destroyed and deserted are nothing but a well planned illusion, used by the planet's elite, to force the rest of the population underground and instill fear, so that the few can enjoy unlimited well being on the surface. Life went on as usual in the beginning. The only difference was that we were not permitted to step outside at all for our own safety. A system had already been developed that allowed us to perform our tasks, even before the “ big event” which released a huge amount of toxic nuclear material in the air. Nobody was punished for the “big event”, the blame was equally apportioned among all nations. At the time I found the justice's decision fair, since although not all nations managed to acquire nuclear weaponry, all of them had wished for it. They gradually moved the surviving population underground to shelters they had been preparing for a long time. Thanks to the “system”, most of us could keep our old jobs. It was kind of a relief at the time for most of us to be able to keep a piece of the old reality. What we still do as a daily routine on working days is we wake up and just push the button. Then our holograms are activated and we are able to perform exactly as before. To give us a better image of reality in the beginning, they let our holograms live, so to speak, in our old houses. Nowadays, we are all entitled to design our hologram's home on our own, or hire somebody who can do it. Hologram fashion and beauty tips have been developed as well. Most people see the holograms as a blessing, remembering how tiring life used to be before their appearance. The transition to the new conditions proved less difficult than expected as most of us were prepared though different kinds of social networks, which we had been involved with voluntarily, before the “big event” happened, using made up avatars that interacted with each other for fun. Most people do not miss the old life. Most people settled for the substitute. Most people do not miss the sunshine. What I find mostly annoying though, is that there is a whole new generation with no true memory of the sunshine. The kids have no option and they never will. That is where the conspiracy theories came from too. Some of the young began doubting the status quo and developed the “False simulation” theory. According to this theory, there is no real simulation up there on the surface, in the sense, that the reality that we are taught to perceive as false is actually the real one. As a consequence, we do not perform aimless jobs that we are paid for out of the government's generosity. The rich and the powerful still enjoy our services through our working holograms in a beautiful and well protected environment, devoid of poor people's protests for justice and equality. We are all happy this way. Especially the workers' jobs are way less tiring, although the scientists put almost the same amount of energy in their work, even though they do not have to move at all. The democracy is restricted but we still consider the regime democratic. Elections happen once in ten years, due to necessary cuts. Every second generation elections are on a debate lately, as the budget calculated to sustain wages does not permit uncontrolled and unnecessary expenses, but this is rather a controversial subject. After working for the government for almost twenty years, the supervisor finally entrusted me with a mission of extreme importance. I was one of the few to go up to the surface, in order to gather material to be examined. My stay was supposed to last only a few minutes, as a longer visit would endanger my life. As a scientist, I never believed in the “False simulation” theory, nor have I supported it, due to obvious lack of evidence, though I must confess I always found it extremely intriguing. That was actually my chance to either prove it wrong or right. Coming out of the uniform I feel a bit disappointed with what I had the chance to see. Deep inside there was a hidden hope that the conspiracy theorists would be confirmed, that we are indeed the victims of a terrible propaganda that managed to push us underground, in order to ensure improved life conditions to the privileged. Despite all evidence dictating to the contrary, I am not fully convinced yet, although I realize that this gut feeling I cannot seem to escape from might be the last spark of hope, doomed to be extinguished soon. Suddenly I long for the sun. One more sunbeam, directed onto my eyes, is my only wish. No glasses, no helmet, no uniform. Unprotected sun exposure was dangerous even in our years of bliss, back when we had the chance of sunbathing every once in a while. I am aware of the fact that I will surely lose my life either way, either by uncontrollable pollution or the government's agents who won't allow me to live to tell the truth, if the truth does not agree with what I have been instilled with all these years. The human soul is rather unpredictable though, when it comes to longing and the survival instinct is overestimated. I am running to the trap door that leads to the surface. The guards are trying to stop me. The guards are backing down, covering their faces, as I am opening the door and jump outside. The old town is nearly unrecognizable. In spite of the sunshine limiting my vision, as my eyes are not accustomed to natural light, I manage to get a glimpse of the world I used to know covered by greenery that keeps on growing, defying every lie I have swallowed over the years. A few steps into the lush vegetation, I am able to get a look at them, waiting for me, pointing their guns towards my direction. I open my arms and my eyes, welcoming the end. One last look at the sun. One last taste of truth. One last breath before I hit the ground. “One more case of suicide has been reported this afternoon, as an aspiring scientist ignored all precautions and attempted to step on the “old land” unprotected. His colleagues are deeply sorrowed by the loss, confirming what was already suspected by the police; the man looked severely depressed before the incident. Mileva Anastasiadou is a neurologist, living and working in Athens, Greece. She has published two books, a collection of short stories and a novel. 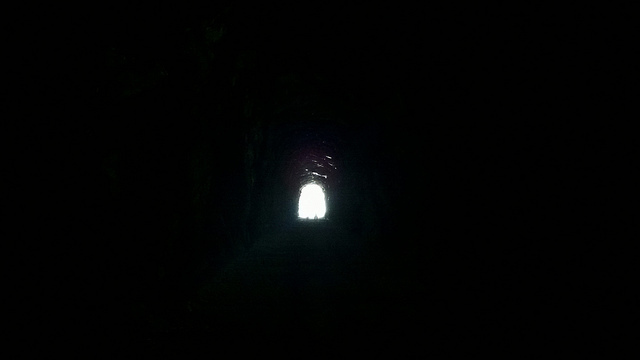 Image: "The light at the end of the tunnel" by Ruth Hartnup.